Addressing the media persons on the occasion of foundation day of Indian Journalists Welfare Forum and National Press Day at Haryana Bhawan, Chandigarh today, Governor Acharya Devvrat said that media has always played an important role in nation building. He said that media persons need to work with more positivity in the interest of the nation so that the society could move in a right direction.Congratulating the journalists on the National Press Day, the Governor said that the media was playing important role in to awakening the society. The media has a major role in lives and our daily life starts by reading and viewing news.He said that media has made the world smaller and we get the all the events and happenings around the world at one place due to the media. He expressed concern that print media was going through some difficulties today, although the reliability was the highest, so the growth of print media was must.Acharya Devvrat said that media was the fourth pillar of the democracy. He admitted that journalists should get more facilities at the government end so that they could be able to discharge their duties in more effective manner. He urged the journalists to pay more attention in maintaining credibility while reporting news. 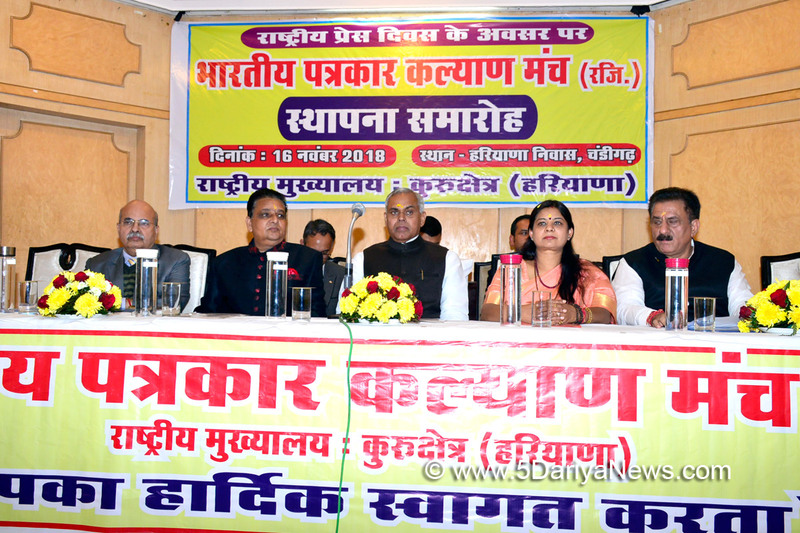 He added that today, some unprofessional people were also active who needed to be identified so that media was not defamed.Emphasizing on the developmental journalism, the Governor said that in Himachal, he has taken several initiatives relating to social issues, which received considerable support from the media. He called upon the media to give prominence to the social welfare activities to create positive thinking in the society.The Governor also gave the Haryana Journalist Welfare Award to the journalists on this occasion.Urban Local Bodies Minister of Haryana Kavita Jain informed about the various facilities being given to the media persons by the Haryana government.Earlier, Pawan Ashri, President of Indian Journalists Welfare Forum welcomed the Governor and informed about the activities of the forum.Subhash Sudha, MLA of Thanesar, Haryana State Information Commissioner Shiv Raman Gaur and other dignitaries were also present on this occasion.